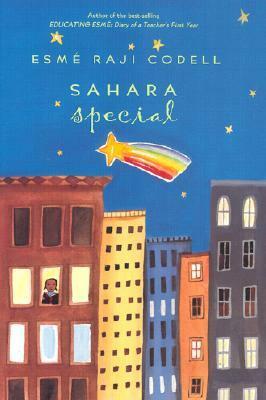 Sahara is bright and loves to read and write, but after she turns in no work in the fifth grade and her teacher uncovers a bunch of sad letters to her father (who has abandoned the family), Sahara is given a tutor to work with in the hallway, leading the other students to call her “Sahara special”. When the tutor also has to work with recalcitrant and possibly violent Darrell, Sahara’s mother has her moved back to the regular classroom and Sahara has to repeat 5th grade. The children in class seem a little nicer, and the teacher is unconventional (we know this because she wears weird clothes, purposefully doesn’t read student files, and publically acknowledges that textbooks make good paperweights). Sahara still doesn’t do much work, but eventually Ms. Pointy (Poitier) gets through to her and Sahara is on her way to doing better in school and becoming a writer. Strengths: The only indication we have that Sahara is not a white student is the tiny picture on the cover, but we can still count this as diverse because she struggles in school. There are not too many books that deal with the emotions of being identified as a special education student. Perhaps in the years since this book has been published, both the way students are treated and the stigma involved in educational help have changed, but I’m sure that our students all know what “testing brush-ups” mean. Like school related books such as Because of Mr. Terupt, differences are celebrated and students are encouraged to succeed. Weaknesses: This book is very slow paced and only mildly funny. It’s the sort of book that teachers seem to like, but which students find less than enthralling. On a personal level, it just kind of annoyed me. Most of the time, in my school, we want students to feel bad about themselves and try everything within our power to embarrass them and make them not succeed. *Sigh*NO! Does Ms. Poitier know how much effort goes in to writing the reports about students that she refuses to look at?